Alan's Factory Outlet metal garages in New Jersey are delivered and installed for free in all of NJ. The metal buildings in New Jersey are built with the steel tubing 4' on center and are fully braced. There are many uses for these steel buildings. 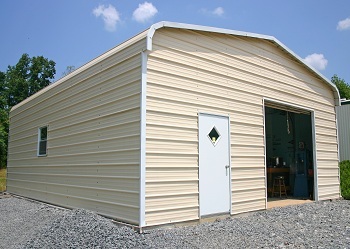 NJ houses may need more storage space, making these portable storage buildings a fantastic solution. New Jersey metal garages are custom built in the size, style and leg height with your choice of size garage door or garage doors that will work best with what you are planning on storing in the metal garage now and in the future. You also get to pick the roof color, trim color and sides and ends out of 13 different colors on the metal garages in New Jersey. With all these choices you can create creative, customized sheds. New Jersey homeowners will love all the options available. Metal buildings are built on site in one on day giving you an easy fast turnkey metal storage building solution. These can be more than just customizable storage sheds. New Jersey homes can always use garages and carports. 14 gauge steel tubing or upgrade to a 12 gauge which has a 20 year rust through warranty for these storage sheds. New Jersey winters will never cause you to worry about these sheds. New Jersey rain and snow won't stand a chance! 8' legs and taller metal buildings in NJ are fully braced with 4' braces in the center and sides, making for safe steel buildings. NJ buyers can rest assured! Three roof styles: Regular barn gambrel roof and two different gable roofs boxed eave and vertical and vertical is built the metal sheeting on the roof up and down so snow will slide off the roof, which is a great feature for sheds in New Jersey. Like Amish built sheds, these metal garages make a great workshop. The metal buildings in New Jersey are now required to be certified for the 130mph and 30 psf. 50 psf certified is also available on the steel buildings.